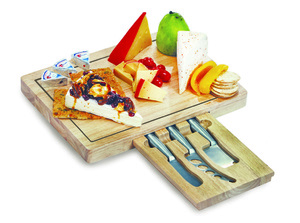 The Guitar cheese board and tool set is an original Picnic Time design like no other you have seen. It features a split level cutting board that swivels open to reveal a corkscrew and two cheese tools (one pointed-tip cheese knife and one hard cheese knife/chisel) neatly stored in the bottom section of the board. It's made of durable eco-friendly rubberwood and has bamboo inlays for the guitar "strings". The Guitar cheese board and tool set makes a perfect gift for guitarists, music enthusiasts, and those who love owning items that are uniquely novel and fun to share with guests. Its brushed stainless steel tools provide the finishing touch to this one-of-a-kind premium entertaining set. The Guitar may just be the talk of the party!